Winner of 5 awards at the CTIA WIRELESS 2008 Conference - including Best of Show - the Samsung Instinct takes touchscreen phones to the next level. Access to GPS Navigation and Email are just the beginning for the Samsung Instinct. Another Smartphone came to the market in June 2008. 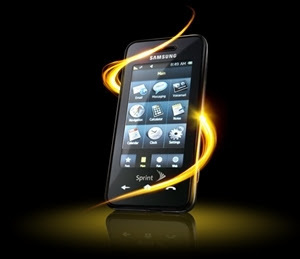 The Samsung Instinct For Sale now are mostly found on the Internet. Available threw Sprint the Instinct M800 is being said by some to be a iPhone cloan. We beg to differ. The Insticnt is a high tech 3G Smartphone with just as many if not more Features and Specifications than iPhone. Sure the iPhone is expected to be growing fast as users learn the advantages of these Internet Connected Smartphones. Using Wi-Fi or a providors data network to get on to the Internet will become a everyday thing for Cell Phone Users. No More hauling around a Laptop/ Notebook Computer just to check Email and perform not just basic tasks but more advanced ones like editing html documents. Look out iPhone many carriers are providing better and more advance services like vCastv and the like through Smartphones like The LG Vu cu920 and the LG Voyager Cell Phones.